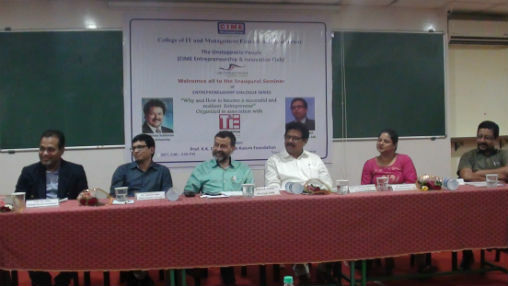 Bhubaneswar: College of IT and Management Education, a government of Odisha higher education institution under BPUT, popularly known as CIME, has launched an Entrepreneurship Dialogue Series to inculcate entrepreneurial spirit among its technology and management students. The series was launched by Prof. Srinivas Subbarao of Sri Sri University and Mr. Ashwini Kumar Rath of Batoi Systems Pvt Ltd. The inaugural talk was titled as “Why and how to become a successful and resilient entrepreneur”. The event was organized by CIME in partnership with TiE, Bhubaneswar. Prof. Ashok Kumar Panda, the Principal of CIME introduced the theme of the series highlighting the need of entrepreneurial spirit in all management and technology students. He stressed upon inculcating the spirit through curriculum, pedagogy, mentoring, internship and specialized trainings. Moderator, Prof. Kamala Kanta Dash of Kalinga Kusum Foundation, opened the discussion by highlighting the contemporary challenges to entrepreneurship in Odisha. He raised questions related to personal, parental and bureaucratic assumptions and attitudes that pose serious challenges to budding entrepreneurs. Prof. Subbarao highlighted the virtues of entrepreneurship and stressed on how only an entrepreneur, not the worker, becomes a leader from the day one. He advocated for entrepreneurship as a career option to strengthen Odisha’s economy. He spoke about the government policies and facilitation support that are available to start a new business. He shared how Sri Sri University has been able to create more than 35 entrepreneurs in last 5 years. He was optimistic that Chief Minister Naveen Patnaik’s dream to take Odisha to the league of top three in the ranking of Ease of Doing Business is an eminent possibility. Mr. Ashwini Rath shared his journey from a student to an entrepreneur. He extensively spoke about how cloud computing is changing the technology landscape of big data, machine learning, artificial intelligence and IOT. He suggested students to follow their dreams and continue to stay focused despite initial challenges. Ms. Swosti Mishra, ED, TiE, Bhubaneswar spoke about the journey and the services TiE offers to budding entrepreneurs. She encouraged the students to stay in touch with her team. More than 150 students from MBA, M. Tech and MCA attended the seminar and enthusiastically participated in the question and answer session. They got insightful tips on various aspects entrepreneurship from the speakers. Prof. R.N. Sahu introduced the guests, Dr. K.S. Rao summarized the session and Prof. Krushna Panda offered vote of thanks.